The Satanic Temple and Chilling Adventures of Sabrina have reached an amicable settlement. The temple filed a lawsuit against Netflix and Warner Bros. for "misappropriation" of their Baphomet statue a few weeks ago. 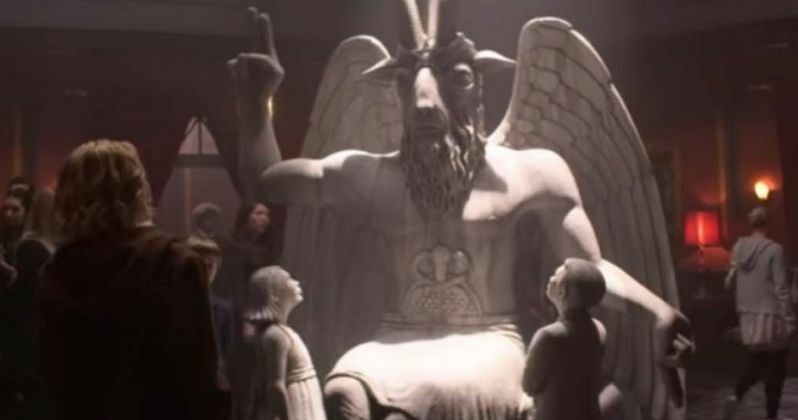 The statue is shown frequently in the series, and the Satanic Temple was looking to get at least $50 million from the streaming platform. Warner Bros. handled the matter and have no further comment beyond stating that it's a "confidential settlement." The terms of the settlement have not been made public, but the Satanic Temple says that they will receive acknowledgement in the credits of the hit series. The Satanic Temple co-founder Lucien Greaves called out Chilling Adventures of Sabrina for using a design of Baphomet that looked a lot like their own version. However, both statues are based off of an old 19th century design, so it seems curious as to why Warner Bros. would settle. Greaves had this to say in a statement about the settlement. "The Satanic Temple is pleased to announce that the lawsuit it recently filed against Warner Bros. and Netflix has been amicably settled. The unique elements of the Satanic Temple's Baphomet statue have been acknowledged in the credits of episodes which have already been filmed. The remaining terms of the settlement are subject to a confidentiality agreement." Lucien Greaves has changed his tune from originally wanting the Baphomet statue digitally erased from Chilling Adventures of Sabrina Season 1. He initially called it an embarrassment and that it hurt the temple's reputation. Now, he seems perfectly fine with the statue and okay with it being in further seasons down the line. Again, there is no word if the Satanic Temple received any monetary compensation in the settlement. The Church of Satan, which has no affiliation with the Satanic Temple, recently released a statement which called out Lucian Greaves' actions as nothing but a publicity stunt. The statement went on to point out some pretty gross stunts that the temple has used in the past, and stood with Chilling Adventures of Sabrina. The church went on to say that they had no problem with Netflix using the Baphomet statue in any way, stating that their version of the statue was based on the same public domain version that the Satanic Temple's was based on. In the end, it appears that the Satanic Temple is happy with the way things turned out in their battle against Chilling Adventures of Sabrina. Lucien Greaves says that he and the temple received a lot of hate mail for trying to attack a show, but he still stands by his original thoughts, even though he's now okay with the statue being utilized from here on out. Regardless, this will hopefully be the last story that we see about the Satanic Temple trying to take down Chilling Adventures of Sabrina. This news was first reported by Variety.